Go Go Yoga for Kids gets children fit, flexible and focused with fun yoga poses and kids yoga classes. Bring mindfulness and self-confidence to your kids classes with our yoga lesson plans, books, teacher training and yoga pose cards. 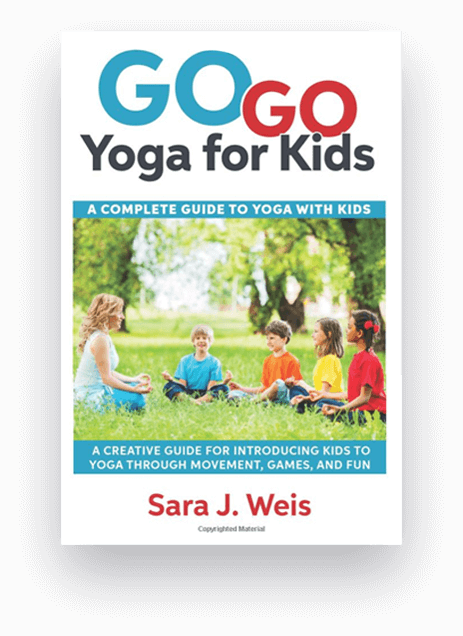 For anyone who enjoys kids and yoga and wants to make a positive difference in their lives, Go Go Yoga for Kids: A Complete Guide to Yoga With Kids is the book for you. It is a complete and creative guide for introducing kids to yoga through movement, mindfulness, fun, and kids yoga games. Learn how to teach kids yoga in your community! If you are looking for ways to effectively teach yoga to children and increase their mindfulness, self-confidence, stress management, and self-control, Go Go Yoga for Kids: Yoga Lessons for Children provides all the tools and resources you will need. 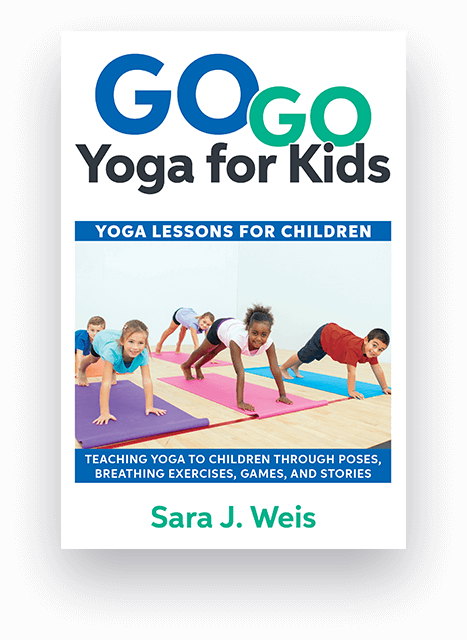 Parents, teachers, children’s yoga instructors, counselors, and health care professionals will find this guide introduces teaching yoga to kids at a whole new level. This book is chalk full of great information to help yoga teachers, classroom teachers, youth leaders, counselors, parents, and any others learn how to implement yoga into the lives of children. Very creative and fun! I highly recommend this book to those wishing to learn how to make yoga fun for kids, and how to empower them to be active as well as mindful and meditative at the same time! “As a kid’s yoga and mindfulness teacher this book is an invaluable guide. Totally accessible and filled with useful information, games, and activities! I love using this book with my students. This is a great book for parents, teachers, babysitters, camp counselors and anyone else who wants to introduce yoga to children but doesn’t know how. I loved that Sara Weis made this book accessible even to people who’ve never done yoga before. 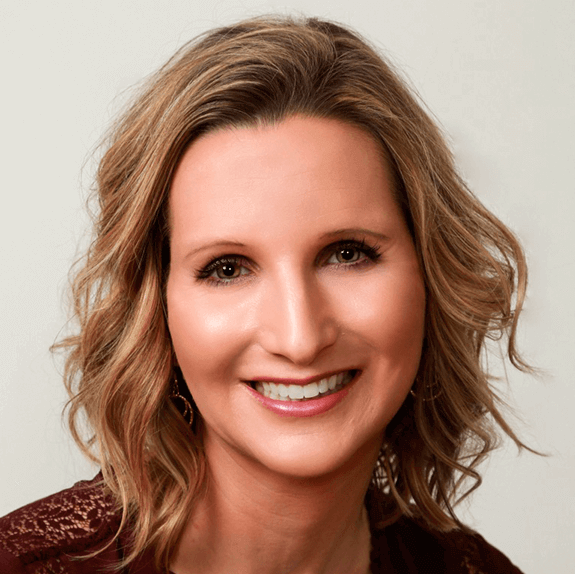 Hi I am Sara, I teach others how to successfully teach kids yoga through lesson plans, yoga games, breathing exercises, and mindfulness strategies to help give children the skills the will have for life. The name Go Go Yoga for Kids was created because of the desire for kids to see yoga as full of movement and fun. A lot of times kids have this image in their mind of yogis sitting cross legged with hands in mudra, eyes shut, and humming. Yoga can definitely have moments that look like that, but yoga for children is also busy, active, and often noisy, while effectively introducing yoga and mindfulness to children. Go Go Yoga for Kids LIVE on the I am a Lovable Me Show! Take the guesswork out of teaching kids yoga with our complete step-by-step lesson planning guide.